Many Texas cattle came into Missouri by way of the Shawnee trail which crossed into Missouri's borders between 1850 - 1900. Generally these cattle crossed where Missouri, Kansas and Oklahoma meet. 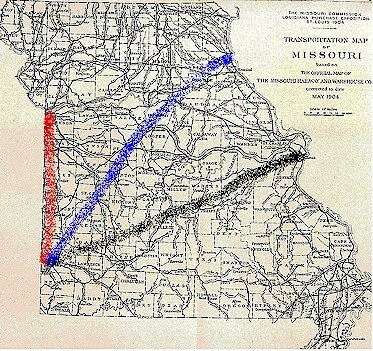 From this point three main trails were taken to the railheads at St Louis, Sedalia , Quincy Illinois and Kansas City. This page was designed by Aaron Rieder.